google-site-verification: google8d8438b214143f71.html Beautiful Quotes: Fall in love with someone who wants you and cherishes you. 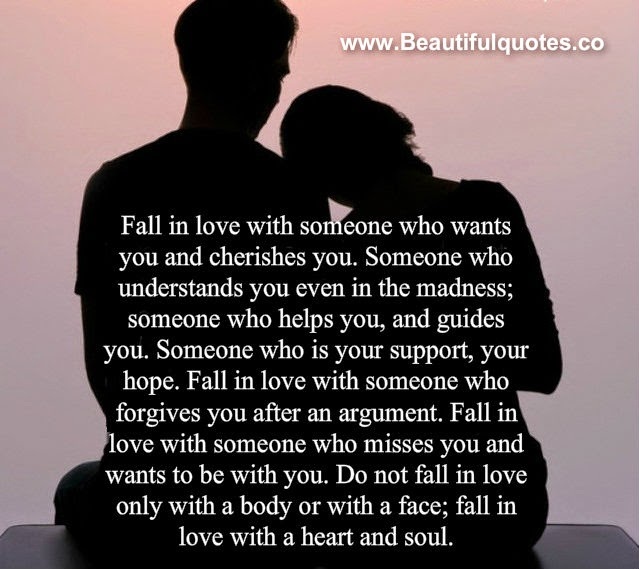 Fall in love with someone who wants you and cherishes you. Fall in love with someone who wants you and cherishes you. Someone who understands you even in the madness; someone who helps you, and guides you. Someone who is your support, your hope. Fall in love with someone who forgives you after an argument. Fall in love with someone who misses you and wants to be with you. Do not fall in love only with a body or with a face; fall in love with a heart and soul.